Myself and some of the urban sketchers capturing the musicians. There's something I find fascinating about sketching musicians. I don't exactly know what it is but it feels right. It's not the easiest thing to do as they move quite a bit but it definitely provides a great sense of well being. And judging by the comments on our meetup page, it certainly looks like I'm not the only one who feels this way. 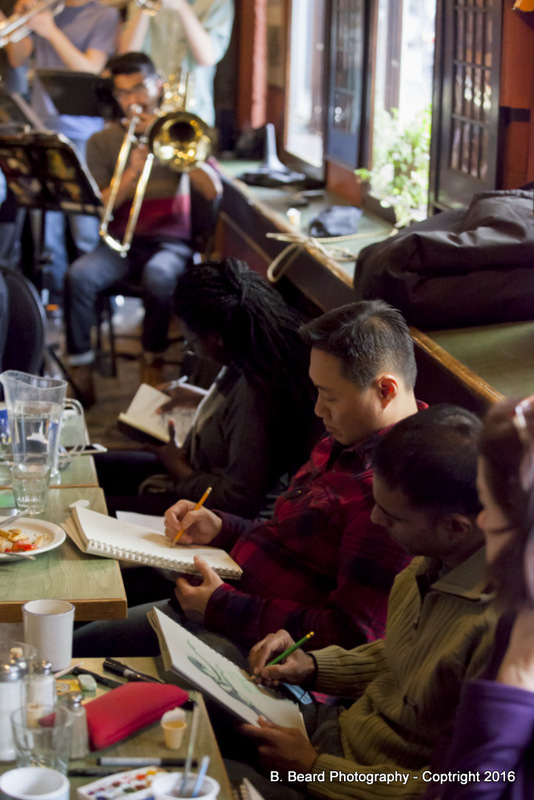 As the weather is getting colder, we need to find indoor spaces to sketch as a group, and The Rex is truly a gift. Located right downtown near Osgoode subway station, this casual and friendly family-run musical mecca offers live Jazz shows every day : 19 shows per week with local and world-renowned musicians. This time we have the pleasure of listening to the Hart House Jazz Combo and the Hart House Jazz Ensemble. They created a beautiful and relaxing ambiance on top of being our models during our sketching session. It was great to witness such talented individuals partake in their passion for music and inspiring to think of the fact that many members were not professional musicians. One of the singers is an actuarian professor and many of the musician are students working on a degree in a different field! Below you can see the results from my sketchbook during the event. The first two were was more of a warm up and getting used to the movement of each musician. Members of the Hart House Jazz combo come on an off stage depending on when it was their turn to play a portion of the song, some moved more then others but I managed to capture some of them. 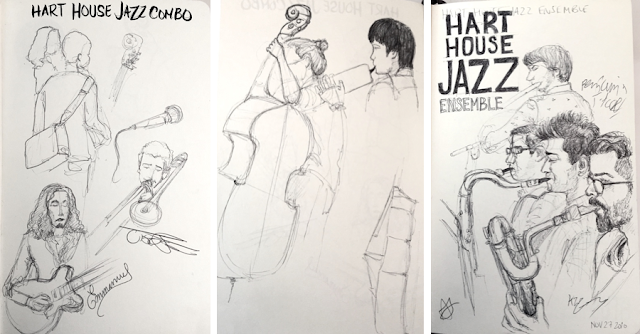 Sketching the Hart House Jazz Ensemble was a little easier because they mostly remained seated. Being really close, I was able to capture more details and at the end of the session some of us got them to sign our sketches for fun. You can see more of the sketches and photos from the event on our Facebook page. 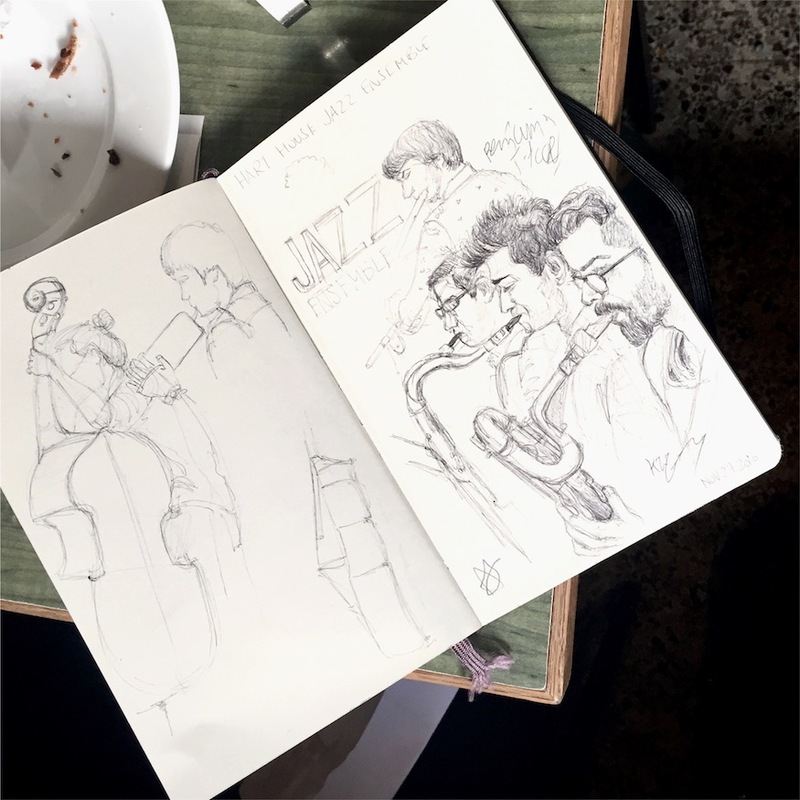 Many of the sketchers are looking forward to the next time we'll be back sketching more musicians playing. It's our second time sketching there and I'm imagine will be back again for more. Part of me wonders if there's a way to collaborate with The Rex in the future and make this a regular thing. We shall see. To get a better idea of our time there, I create this little video summary of our time there. Enjoy!